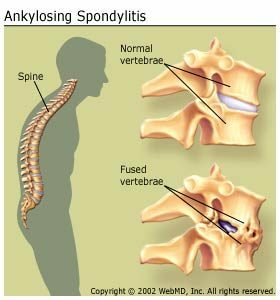 Ankylosing Spondylitis is a severe inflammatory disease that often leads to a calcification and fusion of the joints surrounding the spine. Active Isolated Stretching and Strengthening treatment is highly beneficial for Ankylosing Spondylitis as it naturally opens all the major muscle groups of the entire body. AIS is capable of reversing many of the negative effects of ankylosing spondylitis. Regular treatment in AIS therapy can prevent the fusion and calcification of the vertebral joints surrounding the spinal column. It is very important for Ankylosing Spondylitis patients to become aware of Active Isolated Stretch therapy. AIS treatment may be one of the most important therapy tools for the spondylitis client. AIS is an advanced form of stretching therapy, many times more effective than conventional stretching. Because spondylitis clients are affected by muscular rigidity, working with a therapist will be more productive than working alone. AIS works from multiple angles on each problematic joint. Slow, gentle, repetitive patterns are used in which a therapist helps the client to open hardened muscles. Each target muscle is lengthened from three to six different aspects, which allows a muscle to stay fully open. Because Active Isolated Stretching is thorough in its ability to lengthen muscles, it simultaneously reduces inflammation. Inflammation is affected by contracted muscles surrounding joints. Active Isolated Stretching can prevent calcification of joints by halting muscular inflammation. The sacroiliac joint is a common problem area Ankylosing spondylitis cases, AIS has a detailed plan of how to keep the sacroiliac joint open. This involves opening up the deep six muscles of the hip-thigh complex. These small muscles affect rotation in the hip. The deep six muscles include: quadratus femoris, obturator externus, inferior gemellus, obturator internus, superior gemellus, and piriformis. These small muscles control external rotation in the hip and are responsible for keeping the sacroiliac joint open. Opening the deep six muscles requires working with a trained AIS therapist. These muscles are too deep inside the body to stretch by oneself. Another area that can be greatly improved in spondylitis cases is kyphosis, also called dowager’s hump or hunchback. Kyphosis will occur in spondylitis clients as the condition worsens, but it can be held off by AIS treatment. Treatment involves working the muscles of the upper back, arms, shoulders, chest, and neck muscles. AIS exercises can keep these muscles staying functional which will prevent the onset of kyphosis. Because ankylosing spondylitis is an inflammatory condition, clients with this disorder are affected by fierce joint inflammation,causing rigidity in the muscles that surround the problem joint. That is why Active Isolated Stretching can be applied to ankylosing spondylitis cases with great success.